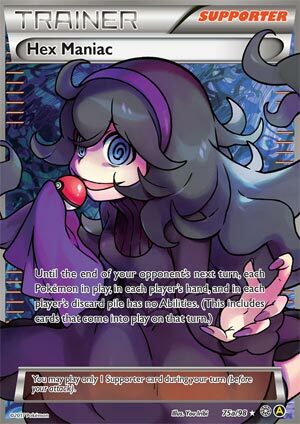 Home Pokémon Pokemon Card of the Day Hex Maniac – Pokemon New Ban List Week! Hex Maniac – Pokemon New Ban List Week! Last week saw the arrival of some startling news for the game, in which the Ban List for Expanded got updated. Not only did it get one or two cards onto the list, it got four new cards put onto the list. And since there happen to be so many cards hitting that list, it only makes sense that we review all of the newbies! The first of these cards to cover is going to be Hex Maniac. In honor of “Maniac Monday”. And if you think that’s crazy, you haven’t seen how well the new banned cards worked out for our week. Anyway, Hex Maniac came out in the XY Ancient Origins set, which was probably one of the most influential sets of the game, containing a number of powerful cards in it that would become staples in a lot of different decks. In Hex Maniac’s case, that would at least be a one-of in most every deck. The Hex Maniac’s effect is simple: until the end of your opponent’s next turn, all Pokemon with Abilities are treated as having no Abilities. This includes in the hand, in play, and in the discard pile, effectively shutting down all Abilities for a couple of turns. This sort of effect could be used to get past annoying Safeguard Abilities or else to slow your opponent down by removing a lot of their set-up options, and in either case it puts the person who played Hex Maniac at an immense advantage. As the Expanded format has only grown more and more, with no sets having yet been rotated out of the Expanded format, Hex Maniac’s effect only continues to get stronger and stronger, having the power to shut down even more Abilities that get released. So really for the sake of the format’s health, it makes sense to have a card like Hex Maniac hit the Ban List, even if she is best trainer character. I mean Skyla’s still best girl, but you know, Hexy’s got an appeal to her. Arora Notealus: Hex Maniac has been reviewed 3 other times on the site, as our #5 card in the Top 10 for the set (just to give an idea of how powerful some of the other cards were, though time would redefine that list), as #8 on the Top Cards of the Year 2015, and as #4 on our Top Cards lost to Rotation back in 2017. Any card that can hit a Top 10 list three times is powerful enough in its own right, even if its performance isn’t exactly #1 every time. Side Review: Empoleon – the Type change hasn’t done much for Empoleon’s playability, but that may be more due to his Stage 2 status rather than his Typing. Despite a strong attack in Total Command, Empoleon is working around with having to evolve off of Piplup and Prinplup in some manner, making him much slower than some of the more competitive decks out there. Next Time: It’s gonna be Trump Tuesday! And no, it’s not for the current sitting US president. This week, we’re taking a look at cards that have been banned from the Expanded format. In the light of what just happened a few days ago, four more cards have been hit by the ban Hammer in addition to the cards that were already banned, which would be Lysandre’s Trump Card, Forest of Giant Plants, and Archeops BW Noble Victories. This time, Hex Maniac, Wally, Puzzle of Time, and Ghetsis is banned in Expanded! So with seven cards that are banned, this is enough material to work with for this week’s Card of the Day, though we’ll be looking at five of them. Today, we’re looking at Hex Maniac from XY Ancient Origins. It was first reviewed as the 5th best card of the set from the top 15, then the 8th best card of 2015, and when we bid farewell on the 4th best card lost to rotation in 2017. This Supporter card states that when you play this card from your hand, all Pokémon in play, in their hand, and in their discard pile has no abilities until the end of your opponent’s next turn. So, why did this particular card got banned? Hex Maniac is meant to be double-sided, one that neither one could take advantage for one turn. But the problem for such a double sided effect is the timing of when you play this card. While playing this makes all abilities go offline, one can’t look past the fact that the player that is about to use Hex Maniac can easily take the moment to use up their abilities before playing this Supporter. Suddenly, this makes it more like a one-sided lock as opposed to two………….because you already used up your abilities, so having your abilities shut down isn’t so much of an issue unless you have Pokémon whose abilities are passive. Reading my older review, I mentioned that it could be a clutch moment so that your opponent cannot make use of their abilities to possibly secure victory the next turn had you not played Hex Maniac. But with how this card has been abused to the greatest extent, I suspect that’s where some of the complaints came from. One might wonder why Garbodor’s Garbotoxin didn’t get the boot. After all, much like how you could previously use Hex Maniac 12 times if you had 4 of this, 4 Puzzle of Time, and 4 VS Seeker, in Garbotoxin’s case? 4 Tool Scrapper, 4 Field Blower, 4 Xerosic gives you 12 opportunities to get your abilities online before you turn it off again. Granted, your opponent has an answer against Garbotoxin by using some of the item cards mentioned above, so it seems like Garbodor is more manageable than Hex Maniac. It is what it is, and we have to deal with not being able to use this card outside of Limited and Unlimited formats, which it won’t do so well in either of them. I opt not to give ratings for banned cards. Ban week! Yes this week we review the bad boys (and girl… and fossil) of the Pokemon world. Yes, like Ben Affleck at the Hard Rock Casino, Martha Stewart and the UK, and Sinead O’Connor and SNL, we’re reviewing cards this week that have been – or are about to be – banned from the game of Pokemon. Pokemon doesn’t outright delete cards out of existence often, so when they do it’s worth writing about. Especially the fact that four cards were announced last week, that news sent shock waves through the community. We’ve been without Hex Maniac in Standard for a year now. In some ways, you could see this coming with the introduction of Tapu Lele GX into the game, for a span of about four months between May and August 2017 the turn one Hex was a common tactic employed by many skilled players. It would shut off your opponent’s turn 1 Wonder Tag – as well as any other abilities – and give you a good head start over your opponent. Plus, with VS Seeker, Hex would always be lying in wait in the discard pile, ready to come out at a moment’s notice later in the game to completely disrupt your opponent’s strategy to defeat you. The well timed Hex frequently gave the player who knew the perfect time to play it the edge they needed to win the game. I don’t play hardly any Expanded – from what I have briefly read, I’m not sure that Hex was as bad as the Shiftry – FoGP combo that was a no brainer in banning at least half of that duo, but eliminating Hex Maniac seems like a good decision to me. It gives the player who uses it early on just too much of an advantage. There may be specific cases to prove this out that I’m not aware of, but the fact that Hex is being banned doesn’t surprise me in the least. It’s a mythical rating, and considering the format is absolutely going to convulse over the next 45 days (Celestial Storm, Rotation, Dragon Majesty), it doesn’t really mean a whole lot. This was a powerful card when used at the just the right time… obviously too powerful. With our Countdown Of Cards Lost To Rotation finished, time to look at the runners-up from that list before… what’s that? The quarterly update for the Banned List actually had new bans for the Expanded Format? As of August 17th, four cards are being added to the Banned List for Expanded Format play: Ghetsis, Hex Maniac, Puzzle of Time, and Wally! I hope you’ve dressed appropriately, dear readers, as we enjoy a discussion of low skill power plays and complaints both about bans both fresh and vintage… that’s right, this week we feast on Cheese & Whine! It’s just another manic Monday… no, a Maniac Monday, as we cover Hex Maniac (XY – Ancient Origins 75/98, 75a/98). When you play this Trainer-Supporter, until the end of your opponent’s next turn all Pokémon in the discard pile, on the field, and in the hand of either player has no Abilities. If a Pokémon with an Ability goes from one of these places to another of these places, or even back again, it still has no Ability for the duration of this effect. If there is an Ability that triggers in the deck, Prizes, or Lost Zone then I believe it could activate, even if (at the start of your turn) that card was in one of the affected zones. I’m not sure if there are any ways to counter this effect; while a card can easily be broken even if there are counters available to it, that probably should have been the first sign that Hex Maniac might be a little too good. The review crew has rated the card highly multiple times; fifth-place in our XY – Ancient Origins countdown, an eighth-place finish for all of 2015, and fourth-place for the cards we lost when we switched to the current BKT-On Standard Format. Personally, I thought she looked like a pretty good card at first but she turned out to be a great card… and now a banned card. Why? One of the “tricks” of balancing out a card effect is to have it do the same thing to both players. The cost of playing the card should be just a bit less than the edge provided by being in control of its effect. What makes Hex Maniac so good she’s now gone is the rest of the card pool. In all the previous reviews, I pointed out how any deck which does not rely on an Ability while it is attacking, between your opponent’s turn and your own turn, or during your opponent’s turn could easily make use of Hex Maniac. It can sometimes be tricky, but for the most part, you just use your own Abilities (if any) then play Hex Maniac after the fact, with no drawback to you save using up a card from your hand and your Supporter for the turn. Those aren’t irrelevant costs, but the payout is your opponent losing access to some pretty common power plays, like fetching a desired Supporter from his or her deck via Tapu Lele-GX and its “Wonder Tag” Ability, drawing extra cards via a variety of Abilities, and a few more that are less than deck specific and widely used. Key Abilities, the kind a deck may be built around, rarely are one-and-done effects. Just losing access to them for a turn hurts, and with proper timing, can prove fatal. Protection from damage? Energy acceleration to prep a new attacker? If it isn’t there when it counts, it may not matter it was present the rest of the game. While these are some impressive feats, are they really enough to justify banning Hex Maniac? We’re dealing with the Expanded Format, so there are many combos that work with Hex Maniac. In fact, pretty generic combos available to most decks that do not clash with Hex Maniac. Let’s start with the combo still available to Standard play and seen in nearly ever Standard Format competitive deck; if you need a Supporter, you use a copy Ultra Mall or Mysterious Treasure fetch Tapu Lele-GX from your deck, Bench it to Active Wonder Tage, and get that Supporter. We’re still missing VS Seeker in Standard, and even though (to my shock) some tournament winning decks actually manage to go without it, most run VS Seeker and at a three or four count. Former staple Battle Compressor is no used only in certain decks, but some of those certain decks are still high performing so it is worth mentioning that one of the three cards you toss can be Hex Maniac… setting up for the previously mentioned VS Seeker. Though most decks running it have higher priority targets, there is also Puzzle of Time; it can get anything back from your discard pile with its second effect, which includes Hex Maniac herself as well as VS Seeker. Why do the search and recycling matter so much to this card? If you sense your opponent is in need of Abilities when you’re going first, you have a good chance of pulling off a T1 Hex Maniac and possibly shutting your opponent’s entire deck down before it actually gets started. Simply put, a lot of decks are relying on an Ultra Ball to Tapu Lele-GX to get the draw or search Supporter needed to open, or even the old Battle Compressor/VS Seeker combo, and running fewer actual Supporters. Alone, this wouldn’t mean much, but the other issue is that a single copy of Hex Maniac can be recycled three or four times in your typical deck thanks to VS Seeker. For Ability reliant decks, this creates a very lopsided mess; they can’t pull this trick on each other all that easily but decks not overly reliant on Abilities could shut them down for several turns, allowing the latter to steamroll the former. A deck also running Puzzle of Time could turn a single Hex Maniac into a functionally one-sided Item lock that lasts up to nine turns! Yes, that is unlikely but often you won’t need anywhere near that many turns to create a dramatic lead or even win. So we say goodbye to Hex Maniac. As a reminder, just because a card is banned does not mean I’ll award it a 5/5. Even if I consider the card itself to be broken, not all broken cards are equal; some can actually be surprisingly weak, outside of their game-balance breaking niche.